Why not list creature types, old or new, you'd like to see in P:E.
Or just brainstorm some weird and wonderful creature combos as inspiration for game content. Some examples. Sirens, legions of the damned (like zombies, but more tragic), nazis, rocklobsters, like the medusa thing but maybe without turning to stone - maybe eyesight causes mild combustion or something, banshees, piranhas (water hazard), landsharks, annnnd bloodflies (from I book I'm reading - large with nasty bites that soften the skin for the embedded larva eggs; be best to kill these without being bitten much, for the bites will cause them to multiply). I'd really like to see those creatures in this game cause they are not used much really in other games. * Creatures in Project Eternity, now that's a good question. Above are my types; as you see am not a fan of zombies, but there is a lot of great other undead creatures like a ghoul, vampire or lich. ** Oh come on! Censorship of a creature name, because of a rooster? Seriously? Edited by Messier-31, 01 February 2013 - 01:24 AM. as you see am not a fan of zombies, but there is a lot of great other undead creatures like a ghoul, vampire or lich. Some ideas in this thread on how to revamp skeletons and zombies. Edited by TRX850, 01 February 2013 - 01:55 AM. Aquatic elves, sahaugin, pech (I just adore those little buggers), more or less all kinds of undead, lots of mimics and monsters that appear to one kind of monster but is in fact something else (I love surprises), piercers (I miss them so), owlbears and skulks. I'd honestly largely want original creations, or at the least creatures which look like they fit the setting. 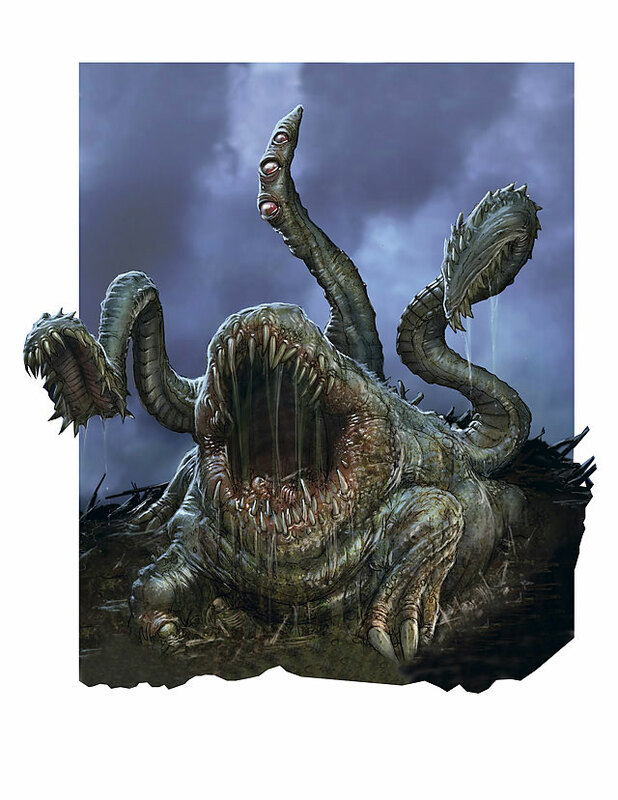 It's a tricky line to follow, as its a lot harder to come up with good new monsters that have the same impact as classical ones, after all, they are classical for a reason, but can definitly be done - mindflayers are really great. They can certainly invoke existing creatures, but just try to get back the wonder of encountering something new, challenging and a bit scary for the first time. Also as a bit of a creature design pedant, I'd kind of like it if creatures generally fall into two categories: either naturally evolved and look plausible as a complete creature, or are created by a sentient being or so. Case to point, I'm not a fan of (classical lion/goat/snake) chimeras in worlds where its suggested they just evolved naturally, but, if there were a world where chimeras were mage-constructs that had gone on to breed that's fine. It's mainly just the multiple head thing really, I don't mind a creature that did have elements of lion, goat and snake but as long as it fit together into a whole creature. Griffins on the other hand are fine - as they do look like a complete creature. There are exceptions, but these are largely archetypal creatures which have variations in many cultures (undead, giants, serpents, were-creatures etc) but even there I'd like some slightly new twists on them that means you aren't just going "oh I'll get out my silver crossbow bolts/wooden stake again" make them defy expectations. Otyughs. For those all important sewer levels. And I haven't seen Stirges since the early SSI games like Pool of Radiance and Curse of the Azure Bonds. I hope I will fight mostly sentient races. (humans, elves, dwarves, orlans, amauen etc) Hell if it were up to me we'd only have humans as a sentient race, but I can live with this. Any "monster" should not be an animal, animals usually avoid combat unless you threaten them..
Mostly, I would love to see a great deal of originality. I would enjoy it if after a while you know the way to fight certain enemies. with that I mean, like in many old games, if you saw a certain enemy, they would telegraph their attacks in a certain way, and after a while you knew how to deal with them. headcrabs =wait for jump and time crowbar swing. those zombies, shoot the headcrab controlling them. preferably with shotgun. those tongue-creatures, just pay attention and avoid them, or feed them explosives barrels. a single revolver shot would do too. I want to see other creatures which focus on debuffing your party (weakness, attribute damage) but don't do much damage. I want critters which act like suicide bombers, with small health but with splash damage. I want trap laying creatures. I want creatures which actually lure you out, rather than vice versa. (one fairly low health but high defence creature retreating into a room you haven't explored, if you're dumb enough to follow, well, serves you right) I actually like to see critters which can teleport your party to split them up. I'd love to see some trickster enemies too, which make you follow them and then disappear, leaving you in a place where finding your way back, you may be accosted by creatures not present before. I think the examples I gave alone would already make for varied combat. In other words, I want variety in tactics as much as I hope to see variety in creatures. this way, encounters can be different based on creatures present. Oh, and wisps and ****. I want some happy magical critters too. Large, spider-like creatures called 'Viders' that use an endoskeleton structure in combination with a chitinous external carapice for protection. Basically a restructuring of the armadillo/tortoise with a segmented outer shell and a leathery hide to protect the exposed fleshy portions. Viders create web-like traps that are reinforced with a framework of twigs, branches, or overhanging arches. Like an armadillo, Viders can curl up into an armored ball for protection against larger creatures. They also possess a toxic bite that can paralyze a captured victim and begin to break down the flesh for consumption. Tree of Misery/Dyrwood Dolmen/Henge of Haunting? In the depths of the tangled forest, upon an old mound stands a black obsidian monolith. In small alcoves carved into the standing stone are set ancient skulls, skulls that seem to look at you as you approach. Striding to the top pf the mound you reach out to touch one, then recoil in fear. The skulls moved, all of them. Slowly the skulls extend on impossibly long spinal cords, swaying in time to a howling moan that tears at your mind. They bob and weave, darting forth to gnash at you and you realise the scream piercing your brain is their maddened, bound souls crying out as one for release and murder. They are hatred and self pity, and they were placed here as punishment for some terrible crime. Perhaps a Cipher might be able to free them or a chanter to listen to their song and alter it so that they might sleep. Edited by Nonek, 01 February 2013 - 09:25 AM. 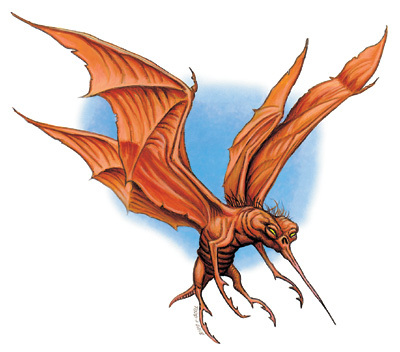 The Jaquarg is a flying creature with insect-like characteristics and behaviors. It begins its life cycle in a larval stage before metamorphosing into a flying scout. The Jaquarq is equipped with a ranged chemical attack that causes intense lethargy. During its larval stage, the Jaquarg is protected and raised by the hive creatures known as the Quarin. The latter are nearly blind, but have a heightened sense of smell that allows them to rapidly home in on the chemical tracers sprayed by the Jaquarg. Thus the two creatures form a symbiotic pair that cooperate on the hunt, with the Jaquarg attacking from range to slow down the prey, while the Quarin rapidly close in and swarm the victims. Once a prey is down, both share in the feast.